Hitech GP uses Brembo as it’s brake supplier and technical partner. Team’s in FIA F3 are free to choose from a range of Brake suppliers to extract performance from their cars. Not only in choose of Brake Calipers but also in discs and pads. As FIA F3 Regulation all teams must use a Hewland F3B Homologated Gearbox which must have at all times 6 Forward Gears and 1 Reverse. The gear shifts are executed with a longitudinally mounted sequential six-speed gearbox. Shifting events are electropneumatically controlled and activated by paddles on the steering wheel. Team’s are free to choose their own mix of ratio’s within the FIA F3 to extract performance from their powertrain. Hitech GP has partnered with Mercedes Benz to power their FIA F3 Drivers to glory. After 2014 marked the beginning of a new era for Formula 3, four-cylinder engines with a maximum cubic capacity of 2,000 cc and direct fuel injection may be used again this year. Series production is not stipulated. Engines must be normally aspirated. The horsepower output is limited by a 28 mm air restrictor (26 mm until 2013). Engines must be built from a production model block (stock block), and often must be sealed by race or series organizers, so no private tuning can be carried out. Paddleshift with electronic display and quick release mounting. All on board datalogging and electronic systems are produced by Bosch. Hitech GP uses Multimatic as it’s technical partner for damper supply. Front suspension uses a pushrod twin damper system with torsion bar springs whilst the rear suspension uses a pushrod twin damper system with coil springs. The damper units manufactured by Multimatic are fully adjustable. The FIA Formula 3 European Championship single-seaters are exclusively shod with Hankook Ventus tyres (180/550 R13 front, 240/570 R13 rear). 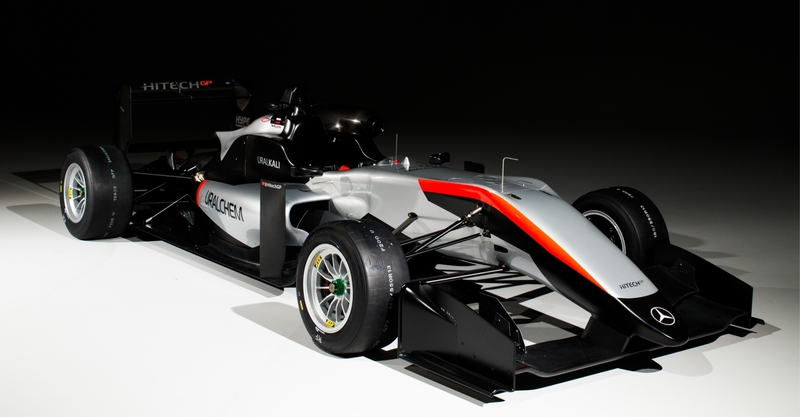 Formula 3 is one of the last remaining series outside of Formula 1 that has an open chassis tender. Meaning teams are able to choose and work with which ever chassis supplier they wish. Hitech GP rely on the know-how of experienced Italian chassis manufacturer Tatuus. The chassis used have been homologated for the 2018 Formula 3 Asian Championship, featuring a Tatuus F.3 T-318 monocoque carbon composite, and FIA homologated Tatuus Halo. The chassis used are the ones of the 2012 specification that have been homologated for Formula 3 up to and including 2019. With their stepped under-floor, a crash box at both the front and the rear as well as two roll-structures, the vehicles are extremely safe. In addition, they have had to pass the strict FIA crash tests for homologation. Still, the drivers should not overdo it: Even in the case of a crash resulting in a massively damaged chassis, replacing the chassis during the course of an event is prohibited. The minimum weight of the vehicle – including the driver in full racing gear and all the fluids apart from the fuel – amounts to 565 kilograms. The car width including the tyres must not exceed 1,850 mm and the minimum wheel base amounts to 2,000 mm. There are 3 options of downforce levels that can be run during the season; Low downforce, medium and high. This is obtained by changing the rear wing main planes, removing or adding front wing flaps or altering positioning and length of the rear floor diffuser trim.